One 14-karat white gold moissanite and diamond engagement ring accompanied by one 14-karat white gold diamond wedding band. 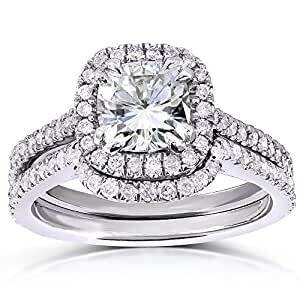 Moissanite is the most serious competition to the diamond today, priding itself for sharing the same levels of fire, brilliance and durability. Our Cushion-Cut Moissanite & Diamond Bridal Set is nothing, but a powerful combination of these two precious stones that are flawlessly decorating the 14-karat white-gold band. The ring counts 88 dazzling cushion-cut stones, with a total center weight of 1/2 carats. We absolutely loved this ring set. We made the choice together; when it arrived I was blown away by how gorgeous it was and couldn’t wait to gift it to my future wife! She loved it too, of course, and we are now happily married! We plan to purchase a 2nd wedding band maybe at our 5th year or 10th year anniversary. This ring truly was our favorite. We love the petite and slim design, it gives it a more distinguished look. Also loved the moissanite stone, it is a smart and wise alternative to the over-hyped diamonds. Definitely recommend! We have received great responses to the ring and are so glad we have it. We both think diamonds are over priced and what counts is we have something pretty and durable for our money.